An important aspect of the art of gardening is working backwards, so let’s begin today by visualizing a stunning display of spring bulbs in your garden next April. There are a great many plants in this category, with a stunning range of colors and forms. The large majority of geophytes are native to the world’s Mediterranean climate regions, which includes coastal California; they have evolved to thrive in climates like that of the Monterey Bay area. For your spring vision to become real, you will need to plant your bulbs this year, in the early fall. You could plant as early as August, or as late as November, but a good time to target is September. To have bulbs to plant in September, order them in July or August. You could buy bulbs later at a local garden center, but retailers necessarily stock mostly the very popular varieties. Ordering by mail will let you choose from an enormous range of possibilities, and early orders are most likely to secure the largest, most productive bulbs. If you acquire your bulbs before you are ready to plant, store them in a dry, well-ventilated place. Before you buy bulbs, you should have a plan for planting. The easy part of planning for a display of spring bulbs is to identify space in your garden that receives—ideally—at least six hours of sunlight daily, and that drains well (no puddles!). There are also a good number of bulbs that will do quite well in partial shade, but if you intend to plant in a shadier area, select bulbs with that condition in mind. 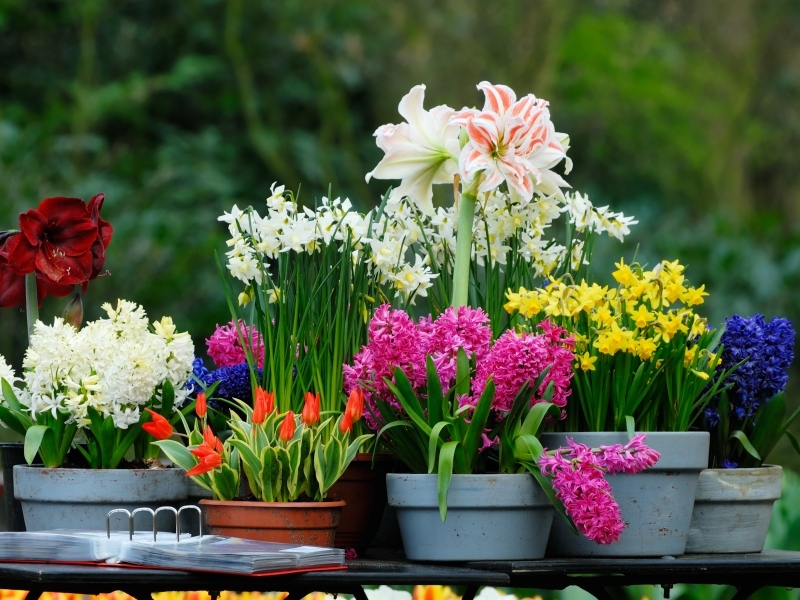 Bulbs also can be grown successfully in containers, given sufficient sun exposure and very well-drained soil. Typical planting mixes are fine, but should be amended with horticultural sand, pumice, crushed lava rock, or other material to promote drainage. Your design could mass your bulbs for a large display of one or several varieties, or place several small cluster displays among other plants in the landscape. The scale of your display will guide your decision on the number of bulbs to order. Growers usually recommend spacing for specific plants, but three times the width of bulb is generally OK. Wider spacing will provide room for increases. The more popular species of bulbs that do not require winter chill to perform well include Daffodil, Crocus, Grape Hyacinth, Allium, Crown Imperial and Snowdrop (Galanthus). Others bloom their best after several days of chill: Tulip, Hyacinth, Siberian Squill, Anemone, Freesia (but some varieties will do fine without special handling). Good mail-order catalogs indicate which bulbs will grow well in Zone 9, which includes the Monterey Bay area, and offer pre-chilled bulbs. To benefit from the full range of mail-order options, select some so-called “minor bulbs,” i.e., those not included among the most familiar species. Adventuresome gardeners leave the beaten path to discover the most interesting blossoms. 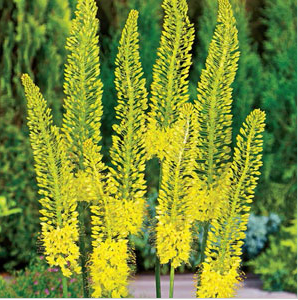 Caption: The Yellow Foxtail Lily (Eremurus stenophyllus) grows 4-5 feet high, with hundreds of star-shaped flowers. Photo: Brecks.com online catalog. Good preparation of the planting area(s) involves removing weeds, loosening the soil, and digging in a three-inch layer of organic compost. If you have clay soil, dig in six inches of compost. This healthful exercise could be enjoyed after ordering the bulbs. Bulbs are traditionally planted in random arrangements, following their natural spread. Planting bulbs in rows is so 19th Century. The actual planting of bulbs in well-prepared beds can be quick and easy. The usual rule for planting depth is three times the height of the bulb. Stab a trowel into the ground, pull it toward you to open a planting hole, drop in the bulb, pointy side up, and cover. If gophers or deer snack in your garden, put a handful of gravel at the bottom of the hole, and spray your bulbs in a bucket before planting with a repellent like Deer Off, Liquid Fence or Repel. You might need to plant in gopher baskets, which of course slows the process. Start now to prepare for next spring’s pleasing display of bulb blossoms. Visit Cindi’s Catalog of Garden Catalogs for many mail-order suppliers of bulbs. Van Bourgondien Bros., good prices for larger volume orders. Finally, visit the website of the Pacific Bulb Society for non-commercial information. Click on the link to “Pacific Bulb Society Wiki” for photos and descriptions by avid growers of geophytes. This entry was posted in Essays 2014, Summer Quarter and tagged Bulbs, Geophytes, Selection by tomkarwin. Bookmark the permalink.